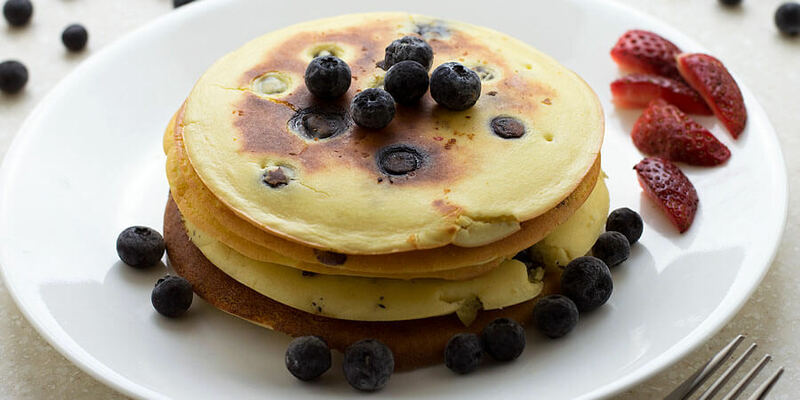 In the matter of a couple minutes, you can make delicious blueberry ricotta pancakes. This is a great breakfast idea for when you want to make a quick, keto friendly, pancake recipe. 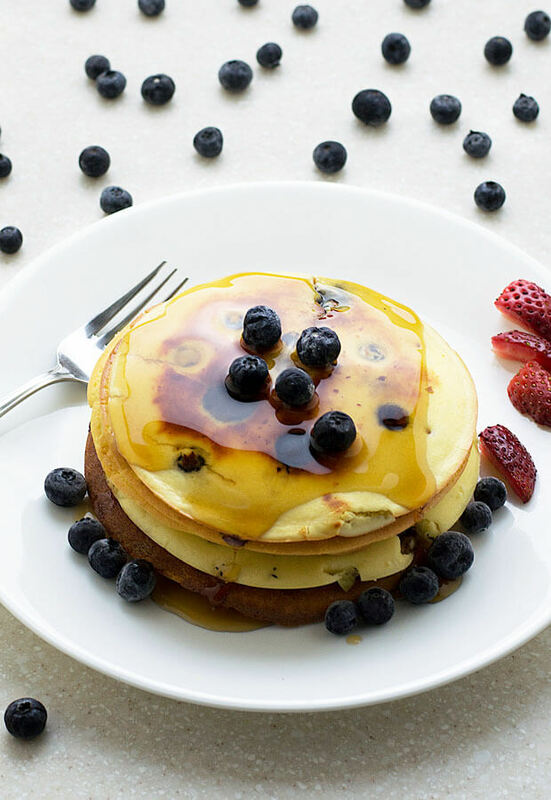 These blueberry pancakes are full of flavor with a little touch of sweetness from adding stevia to the batter. I also used almond flour and golden flaxseed meal in the batter to balance out with the ricotta. All you need is a blender to combine the ingredients together. The results from using a blender is a smooth, fluffy, and moist pancake. The texture isn’t at all grainy from the almond flour. No one can tell that ricotta is hidden in the mixture. 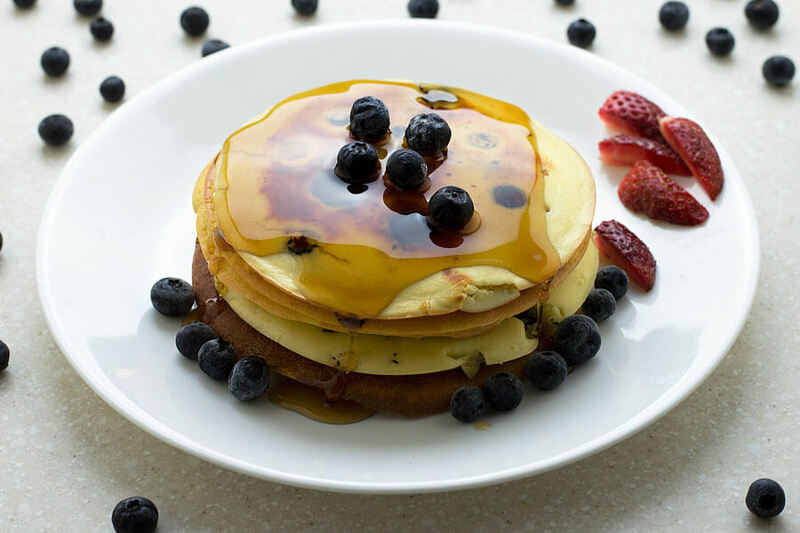 Top off the pancakes with a keto friendly sugar free syrup, or just add some more berries. When I meal prep, I do like to store these pancakes in the freezer. Just wrap each pancake in plastic wrap and grab when you need a quick breakfast. It’s as easy as warming up a pancake or two in the microwave. 1. Preheat a skillet over medium heat. 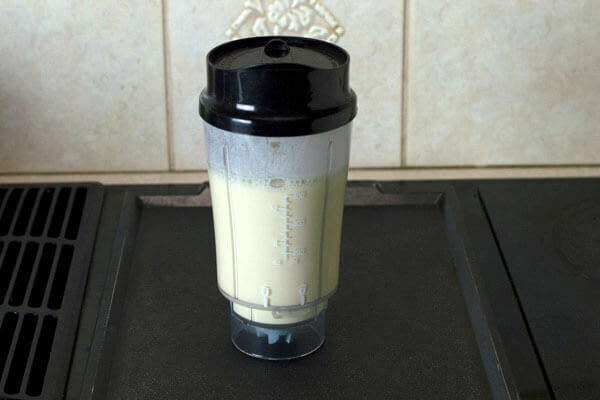 Blend together the eggs, ricotta, vanilla extract, and unsweetened almond milk. 3. Mix together the almond flour, golden flaxseed meal, salt, baking powder, and stevia in a separate bowl. 4. Slowly add the dry ingredients into the blender, and blend until a smooth batter forms. 5. 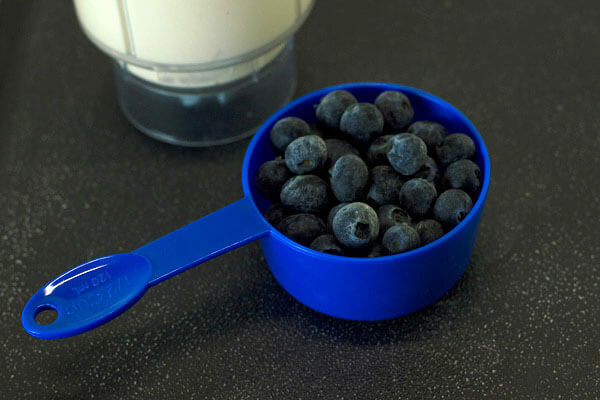 For the ¼ cup of blueberries, you will need to add 2-3 blueberries per pancake. Exact number of berries you have will depend on their size, so feel free to halve them if needed. 6. 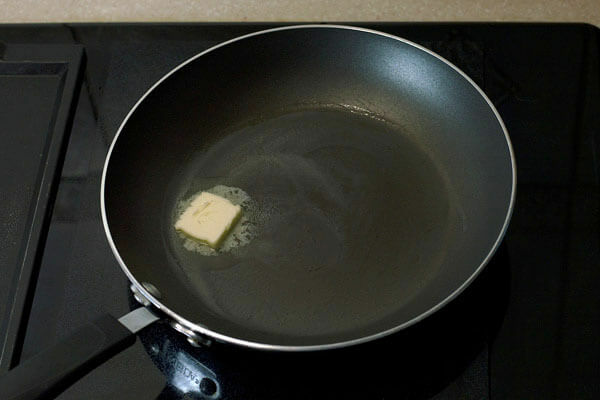 Add butter to the preheated skillet. Wait for the butter to melt. 7. Pour your pancake batter into the skillet and flip when lightly browned on the outside. To get the full number of servings, use a 2 tablespoon measurement to scoop in the batter. 8. Serve with sugar free syrup, or additional berries. This makes a total of 5 servings of Blueberry Ricotta Pancakes. Each pancake comes out to be 311.4 Calories, 22.61g Fats, 5.78g Net Carbs, and 15.25g Protein. Preheat a skillet over medium heat. 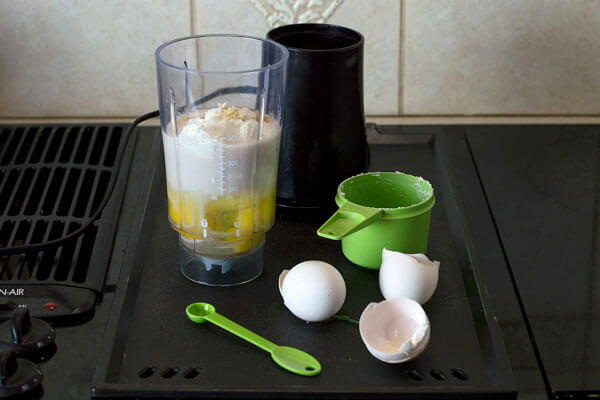 Blend together the eggs, ricotta, vanilla extract, and unsweetened almond milk. Mix together the almond flour, golden flaxseed meal, salt, baking powder, and stevia in a separate bowl. Slowly add the dry ingredients into the blender, and blend until a smooth batter forms. 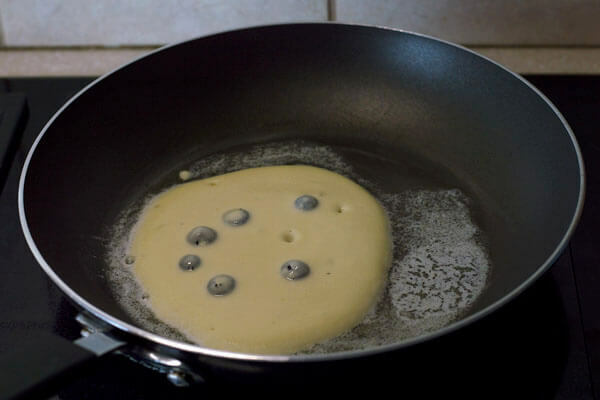 For the ¼ cup of blueberries, you will need to add 2-3 blueberries per pancake. Exact number of berries you have will depend on their size, so feel free to halve them if needed. Add butter to the preheated skillet. Wait for the butter to melt. Pour your pancake batter into the skillet and flip when lightly browned on the outside. 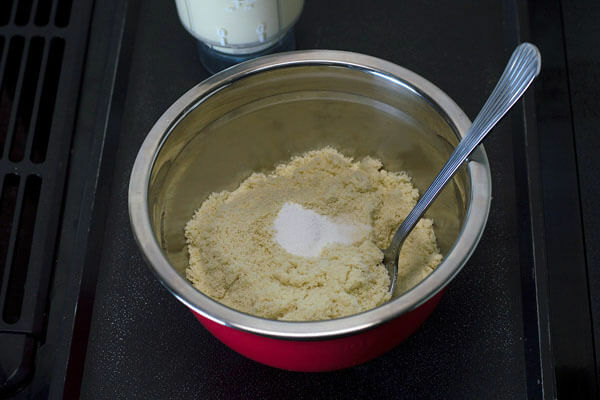 To get the full number of servings, use a 2 tablespoon measurement to scoop in the batter. Serve with sugar free syrup, or additional berries.